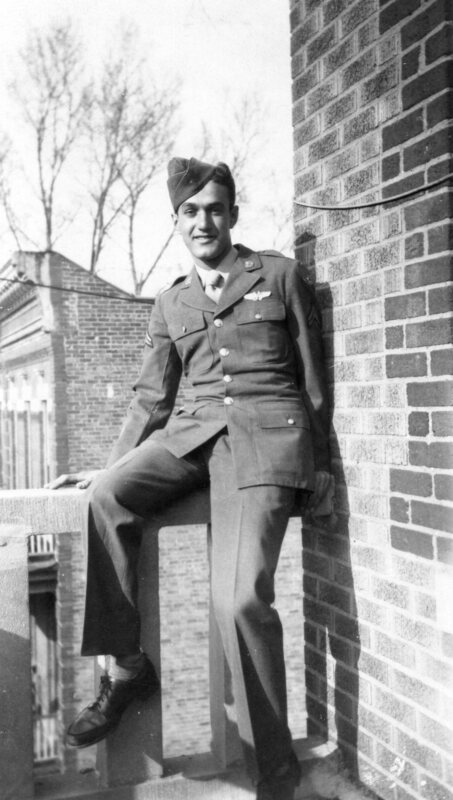 Several years ago, as I was researching the 384th Bomb Group’s mission of September 28, 1944 – the mission on which my dad’s B-17 and another B-17 of his Group collided over Magdeburg, Germany – I wrote about original Buslee crew navigator Chester Rybarczyk. The original post is here. 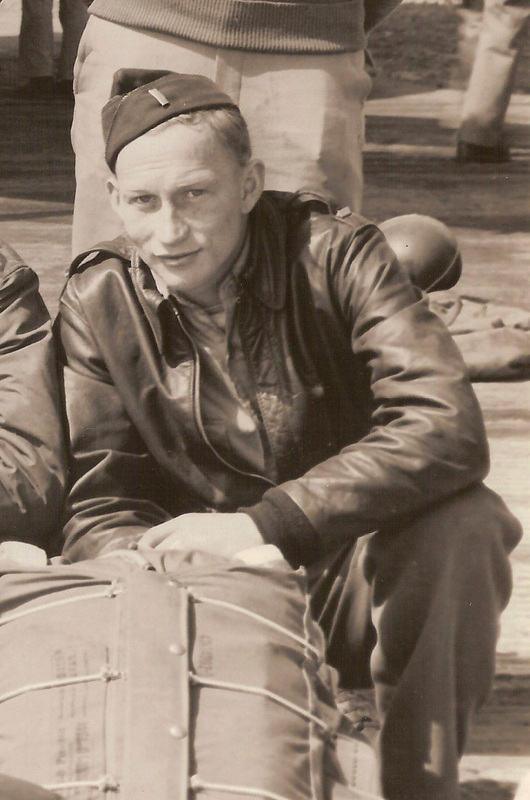 Chester Rybarczyk was flying with the William J. Blankenmeyer crew that day aboard Hot Nuts. The Blankenmeyer crew’s Sortie Report for that mission stated that they “Left formation after target for unknown reasons, but returned to base.” With Rybarczyk on board, I imagined that the reason they left formation was to try to determine the fate of Rybarczyk’s Buslee crewmates as he watched the two planes fall to earth. I have learned that was not the case. The 384th Bomb Group’s Facebook Group is a wealth of information and that is where I found that my reasoning about why the Blankenmeyer crew left formation was not correct. Through the Facebook group, I have made many connections with 384th Bomb Group Veterans and their children, nieces, nephews, grandchildren, and great-nieces and nephews. Sometimes one of them provides me with a missing piece of the puzzle of my father’s WWII service and this was one of those times. 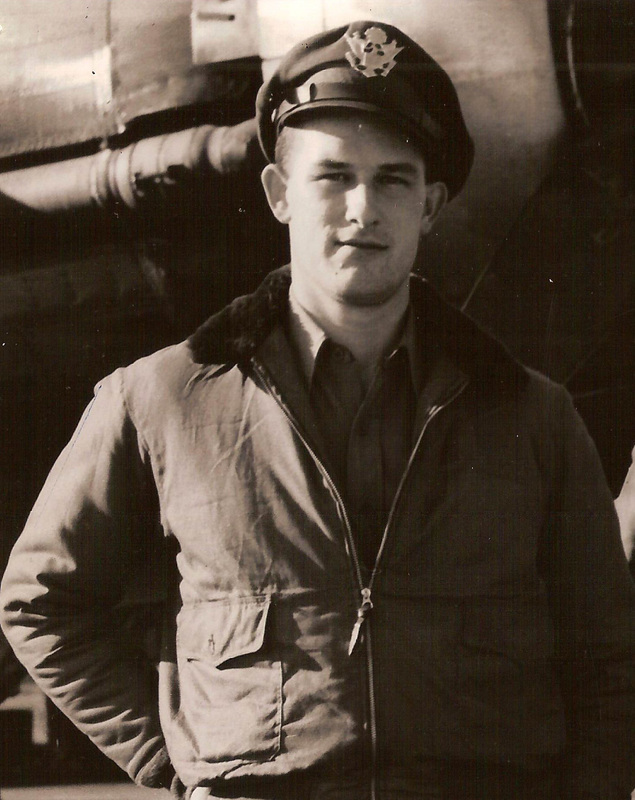 Robert Jeremy “Bob” Fisher was the co-pilot of the Blankenmeyer crew and was aboard Hot Nuts on September 28, 1944. Bob and his son and daughter are all members of the Facebook group. When Bob’s children chimed in on one of the threads on Facebook and mentioned their dad, I looked him up in the 384th Bomb Group’s database and found that he was on that mission and on the B-17 with Chester Rybarczyk. 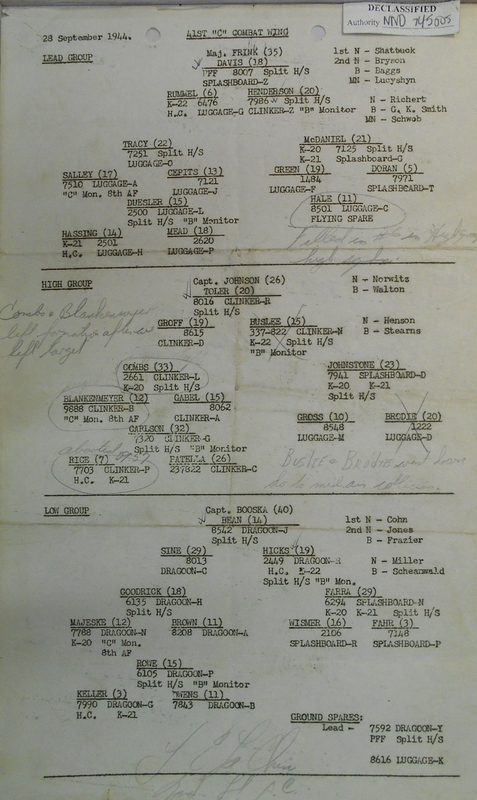 Formation chart of the High Group, September 28, 1944. Buslee and Brodie collide after coming off the target. The Blankenmeyer crew, including co-pilot Bob Fisher and Buslee crew navigator Chester Rybarczyk, witness the collision. Made reciprocal run on target due to group under us when we were to drop the first time. On turn one we almost hit our squadron leader due to an exceedingly sharp turn. On turn off target 2 planes hit together and both went down. Seven chutes reported. Let down more slowly then formation due to the fact that Bill’s ears would not clear. Had some trouble with mine – ambulance met us at dispersal and took Bill to get his ears cleared. Bill grounded-as is Reed and Obermeyer. The reason the Blankenmeyer crew left formation was because the pilot, William J. “Bill” Blankenmeyer was having trouble clearing his ears. But there is another interesting clue in Bob Fisher’s notebook. 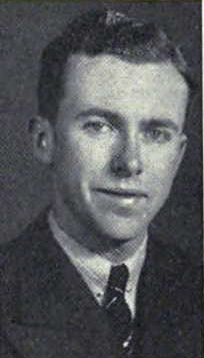 Obermeyer was not the crew’s navigator on September 28, 1944 as he had previously been grounded. Because of his grounding, Chester Rybarczyk filled in for him, keeping him off the Buslee crew’s plane that day. Had he flown with the Buslee crew, he would have been one of the men to perish aboard Lead Banana that day after the mid-air collision. My father, George Edwin Farrar, was the only survivor. On September 28, 1944, the Lead Banana, manned by the Buslee crew, and the Lazy Daisy, manned by the Brodie crew collided after coming off the target at Magdeburg, Germany. Neither crew of the 384th Bomb Group was the original crew as assigned. That day, the Buslee crew was made up of five original crew members and four fill-ins. The Brodie crew was made up of seven original members and two fill-ins. 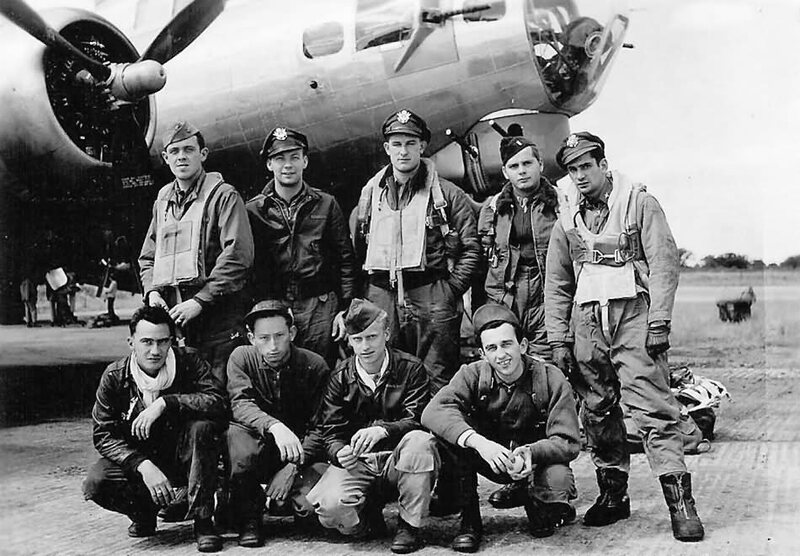 Fourteen out of the eighteen boys aboard the two B-17’s were lost that day. Not only did they leave behind grieving parents and siblings, but they also left behind at least five wives and three children. 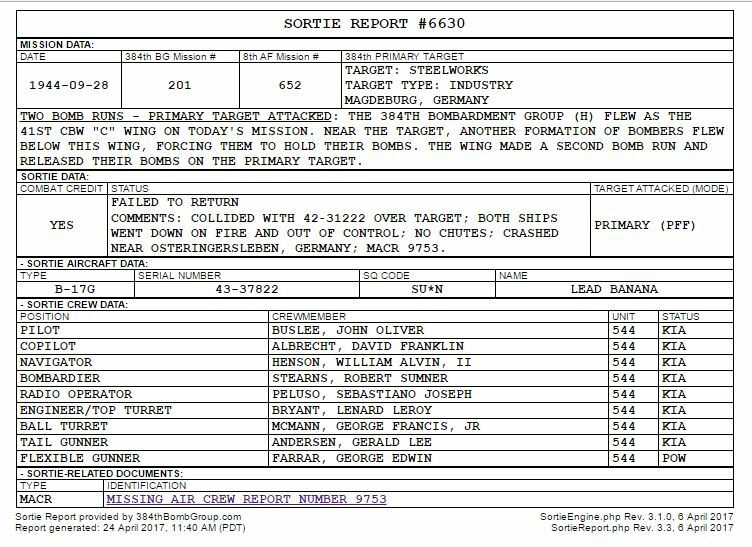 Sortie reports provided by the 384th Bomb Group. William A. Fairfield was a pilot assigned to the 384th Bomb Group, 544th Bomb Squad on AAF Station 106 Special Orders #85 dated May 6, 1944. His first mission was on June 4, 1944. He completed his tour of thirty missions as a commander on this September 13 mission and returned to the states. 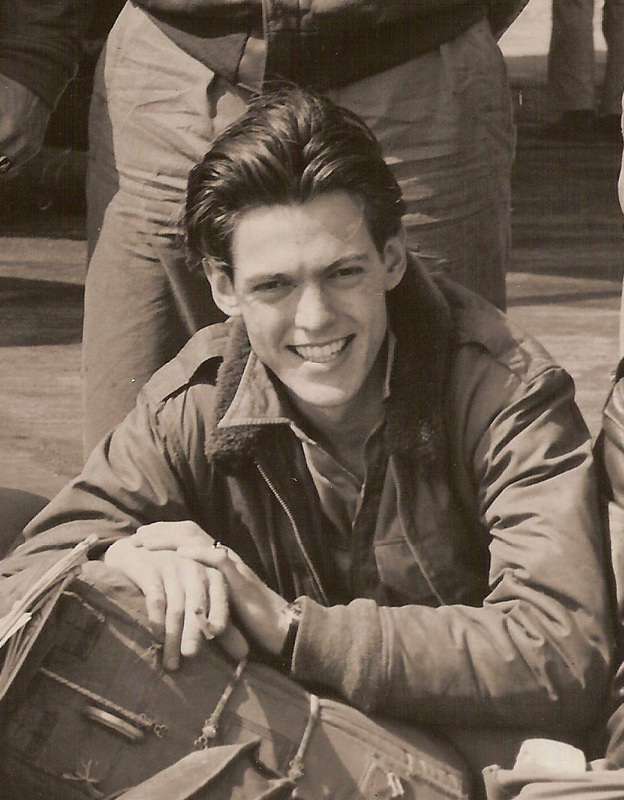 Kenneth S. Lord was a navigator assigned to the 384th Bomb Group, 545th Bomb Squad on AAF Station 106 Special Orders #81 dated May 1, 1944, Edward W. Lane Crew. His first mission was on May 12, 1944. Lord transferred to the 544th Bomb Squad on SO #92 dated May 17, 1944. He completed his tour of twenty-eight missions on February 24, 1945 and returned to the states. 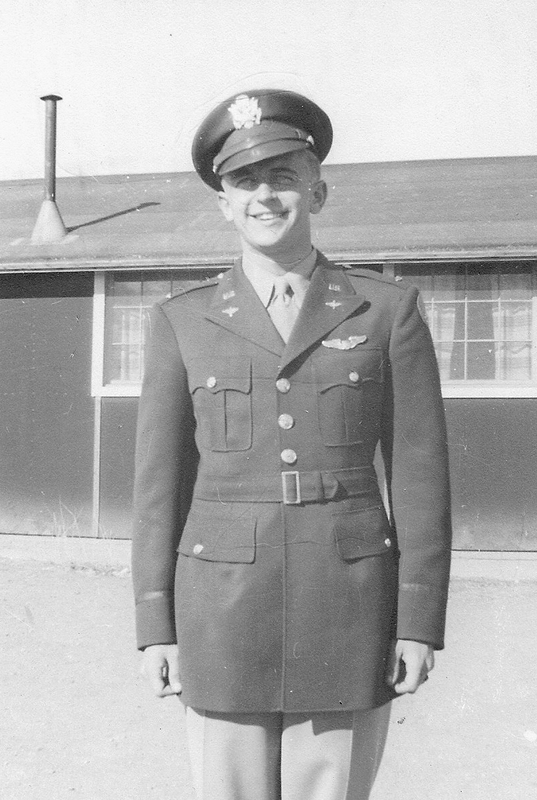 Donald L. Ward was a bombardier assigned to the 384th Bomb Group, 544th Bomb Squad on AAF Station 106 Special Orders #107 dated June 8, 1944, Frank L. Allred Crew. 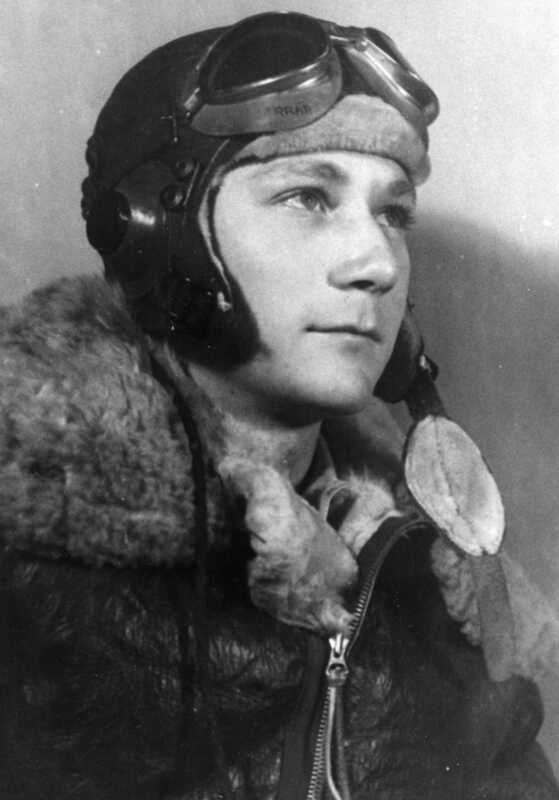 (Robert Mitchell was the ball turret gunner of the Allred crew). 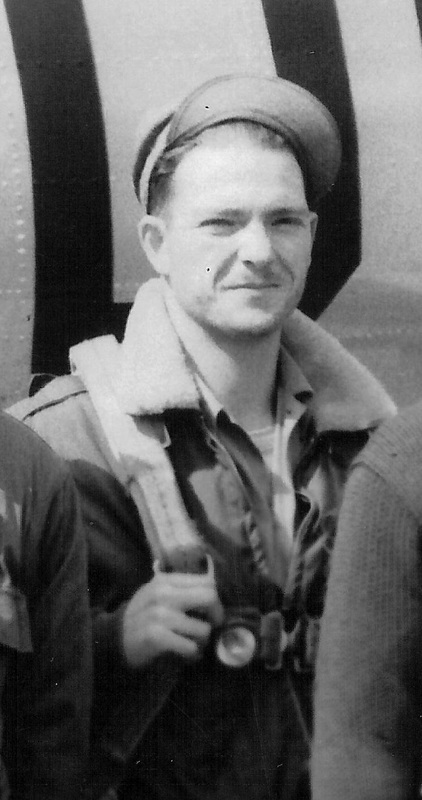 Ward’s first mission was on June 15, 1944. His last of twenty-nine missions with the 384th was on December 6, 1944 and last duty date was December 11, but his record does not show that he completed his tour and returned to the states. 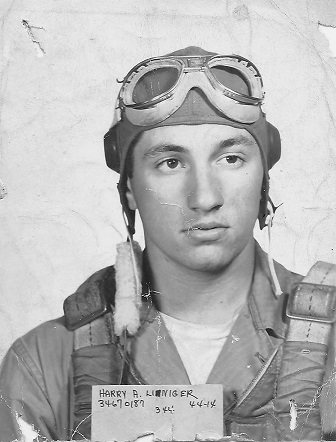 Albert K. Sherriff was a radio operator assigned to the 384th Bomb Group, 544th Bomb Squad on AAF Station 106 Special Orders #80 dated April 29, 1944, Clifford Lee Johnson Crew. His first mission was on May 11, 1944. He completed his tour of thirty-six missions on January 7, 1945 and returned to the states. 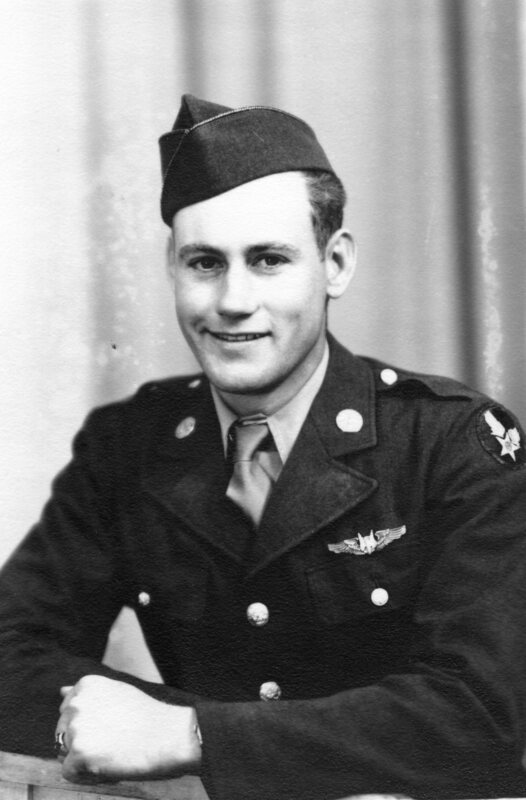 Irving L. Miller was a ball turret gunner assigned to the 384th Bomb Group, 544th Bomb Squad on AAF Station 106 Special Orders #150 dated July 28, 1944, Gilbert R. Lindberg Crew. His first mission was on August 9, 1944. He served five missions, including this one, with George Edwin Farrar. He completed his tour of thirty-four missions on March 19, 1945 and returned to the states. 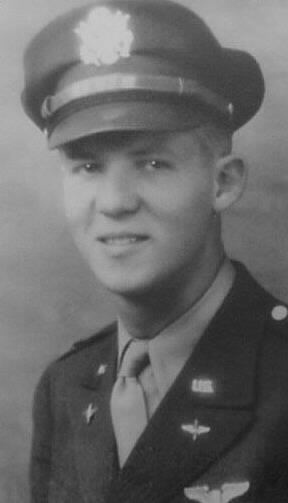 Lloyd E. La Chine started as a bombardier, but changed to tail gunner after his eleventh mission. 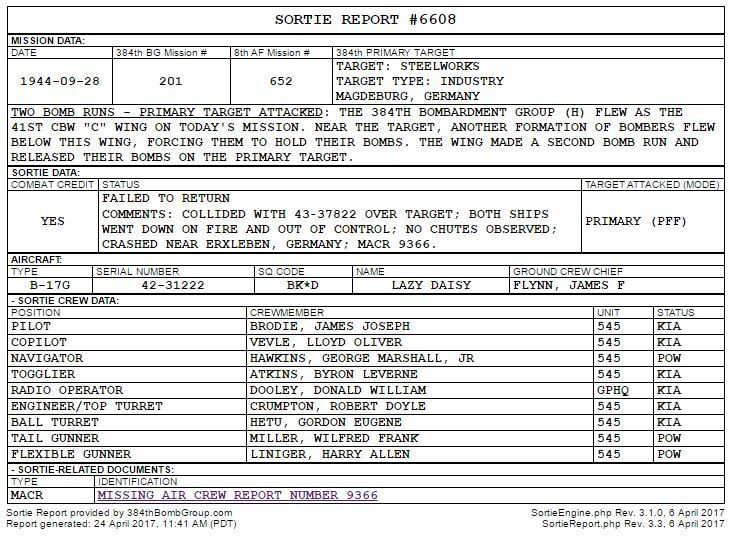 He was assigned to the 384th Bomb Group, 544th Bomb Squad on AAF Station 106 Special Orders #116 dated June 19, 1944, William F. Combs Crew. His first mission was on July 8, 1944. 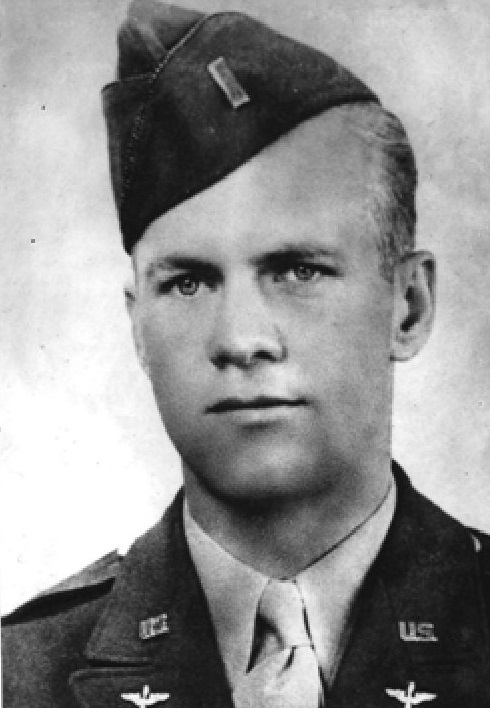 He completed his tour of thirty-one missions on November 2, 1944 and returned to the states. Thank you to www.384thbombgroup.com for kindly sharing these wonderful pictures from their photo gallery. I recently had the pleasure of talking with Robert “Bob” Mitchell on the phone. Bob served on two missions in WWII with my dad, George Edwin Farrar of the Buslee crew of the 384th Bomb Group, and I hoped Bob remembered my dad. Bob did not remember my dad specifically, but he did tell me an interesting story involving the Buslee crew, which I’ll get to in a minute. Until then, I’d like to share with you what I have learned about – and from – Bob Mitchell. 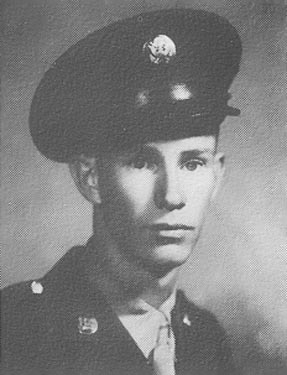 Robert “Bob” McKinley Mitchell, Jr. was born November 21, 1921 to Robert McKinley and Vadie Olivia Stewart Mitchell of Sheffield, Colbert County, Alabama. Sheffield is a small town in northern Alabama between Muscle Shoals and the Tennessee River. In 1930, the Mitchell family lived at 1209 Atlanta Avenue in Sheffield. Robert’s father was a clerk at the post office, while Robert’s mother was busy raising four children. Robert was the oldest at eight, followed by Muriel at five, Opal at four, and Ruth at two. In 1940, the Mitchell family still resided at 1209 Atlanta Avenue. Robert’s father was still with the post office, and his mother was now employed as a florist. The family had grown by three more children, and the brood now consisted two boys and five girls: Robert (18), Muriel (15), Opal (14), Ruth (12), Shirley (9), Elizabeth (5), and Thomas (1). Bob and his high school sweetheart, Joyce Willette Lowe, were married March 21, 1942 in Colbert County, Alabama. Willette was named for her father, William. Bob and Willette knew Bob would be going off to war and decided that they wanted to be married before he left. For a time, Willette worked for the Tennessee Valley Authority (TVA). Bob’s Army Air Forces training included aircraft maintenance training on T38 and T40 turboprop engines at Craig Field, Alabama, instructing aircraft maintenance in Texas, gunnery school at Kendall Field in Florida, and final B-17 bomber crew training in Louisiana. Bob was assigned to the Frank L. Allred crew, 384th Bomb Group, 544th Bomb Squad on AAF Station 106 Special Orders #107 dated June 8, 1944. The 384th Bomb Group was stationed in Grafton Underwood, England. 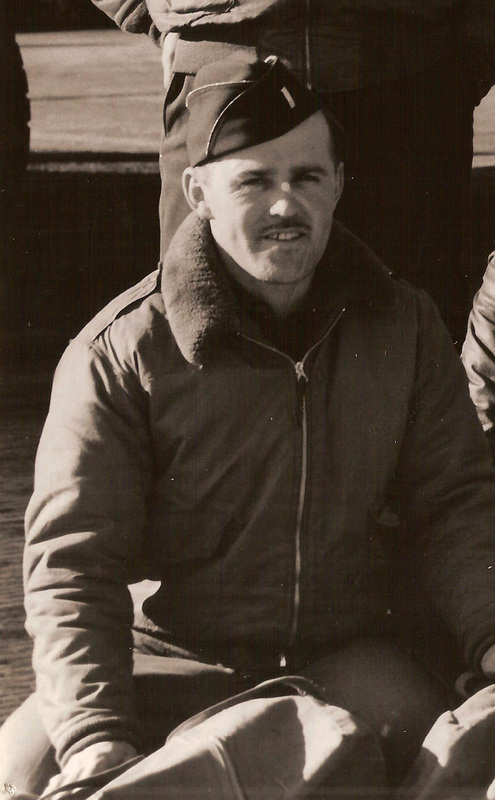 Bob’s MOS (Military Occupational Specialty) was 748 – Army Airplane Mechanic/Gunner, Flight Engineer. During crew training, one of the enlisted crew needed to be assigned to the ball turret and Bob volunteered to man what is considered the most dangerous position in a B-17. Crew identification provided by Robert M. Mitchell, 2 September 2014. The Allred crew and Bob’s first mission was the 384th Bomb Group’s Mission 136 on June 15, 1944. The target was a railroad viaduct in La Possonnièrre, France. The objective of the mission was to cut one of the enemy troop’s main supply routes. The mission was successful, and the Allred crew aboard Hotnuts returned safely to Grafton Underwood. 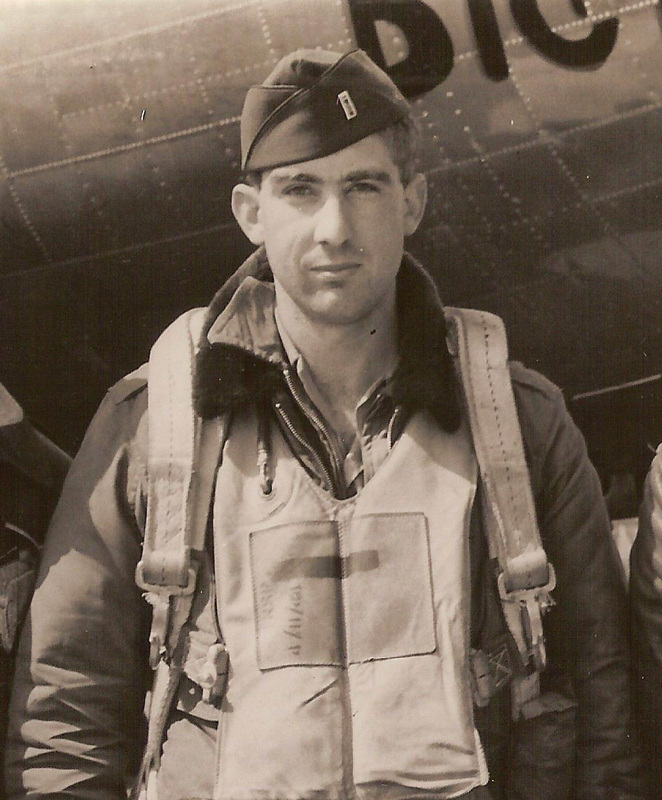 In all, Bob Mitchell completed 35 missions over France and Germany, but the 384th’s Mission 170 on August 3, 1944 was the closest call for the Allred crew. The 384th’s targets were NOBALL V-1 launch sites in Fleury, Flers, and Fiefs, France. NOBALL was the allied code name given to the manufacturing, storage and launching facilities of the German V-1 Flying Bomb and the V-2 Rocket. There were three formations that mission – “H”, “I”, and “J” groups. The “H” group hit their target at Fleury and the “I” group hit theirs at Flers. The “J” group, of which the Allred crew was part, was unable to bomb their target at Fiefs due to the weather. As a result, the Allred crew aboard Devil’s Brat had to return to base with battle damage and a full load of bombs. According to Bob Mitchell, not only did they still have their bombs on board, but the plane caught fire. They crash landed at RAF Chailey, East Sussex just after they crossed the English Channel, still 140 miles from Grafton Underwood. 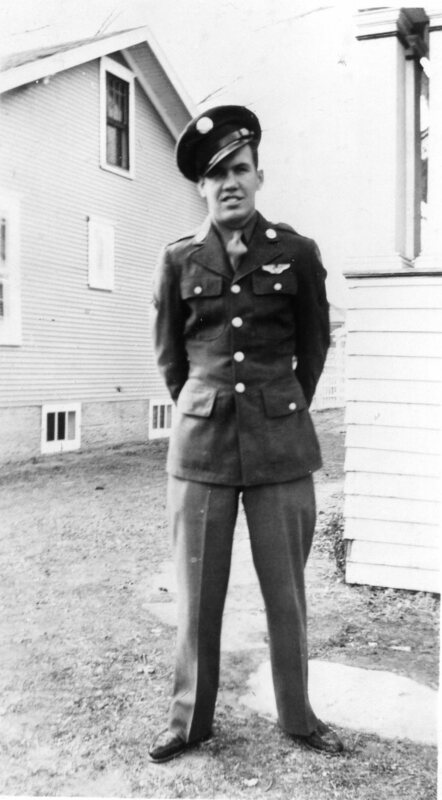 All of the crew got out of the plane before the bombs exploded and all were uninjured except for the engineer/top turret gunner, Raymon L. Noble, who cut his arm on one of the props. Noble didn’t fly another mission for over a month. Bob Mitchell’s thirty-fifth and final mission with the 384th Bomb Group was Mission 201 on September 28, 1944 to a steel manufacturing plant in Magdeburg, Germany. He was scheduled to fly with the Buslee crew that day. 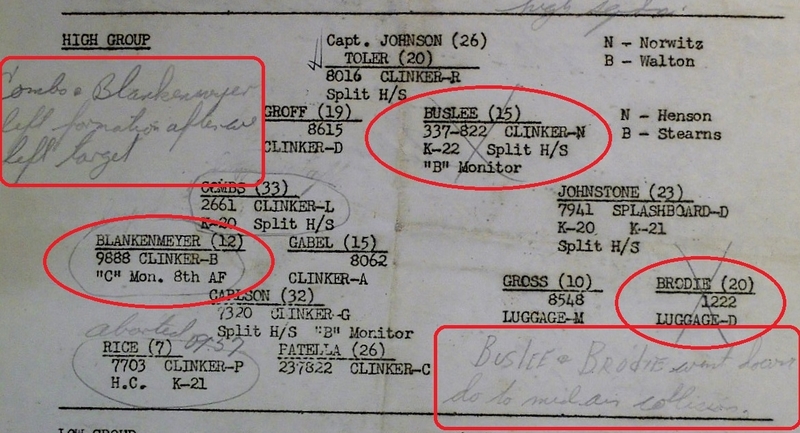 He had just filled in for the Buslee crew’s ball turret gunner the day before, September 27, on Mission 200. Bob had requested to fly with friends from the Allred crew, Raymon L. Noble and Carl H. Redcay, for his last mission, but it didn’t look like his request was going to be honored. September 28 was also Redcay’s thirty-fifth and last mission, but Noble still had one more mission to go. Bob was aboard Lead Banana ready to go with the Buslee crew when a jeep pulled up to the plane. The driver let one man out of the jeep and told Bob to get in. At the last minute, his request had been granted and he was driven over to Lorraine to fly with his Allred crewmates on his final flight. The September 28 mission to Magdeburg was the mission where the Brodie crew in Lazy Daisy collided with the Buslee crew in Lead Banana. My interest in Mission 201 stems from the fact that my dad, George Edwin Farrar, was the only survivor aboard Lead Banana. Only three men aboard Lazy Daisy survived. I continue to look for information and theories about the mid-air collision. New information from Bob gave me another perspective on the accident. Lorraine was to the left of Lead Banana in the formation. Coming off the target at Magdeburg, Bob was still in position in the ball turret of Lorraine, looking out the ball turret’s window, thinking about the fellow in the other ball turret. As he watched the fellow in the ball turret of Lead Banana, he saw the collision occur. He saw the ball turret of Lead Banana knocked off the plane and watched as it fell away. After witnessing the horrific event, Bob understood the significance of his reassignment from Lead Banana to Lorraine that day. With Bob’s thirty-fifth and last mission with the 384th Bomb Group complete, he was able to return home to his wife, Willette. When he returned to the states, even though he had completed thirty-five missions with the 384th, his WWII service was not complete. He went back into training to fly missions in the Japanese theater. Fortunately, before it was time for him to ship out, WWII ended and so did his military service. Bob’s WWII decorations included the Distinguished Flying Cross, the Air Medal with Oak Leaf Cluster, and the European Theater Medal with Five Bronze Stars. One of Bob’s favorite post-war memories was meeting aviator Charles Lindbergh. Lindbergh was the speaker at an event Willette was involved with. 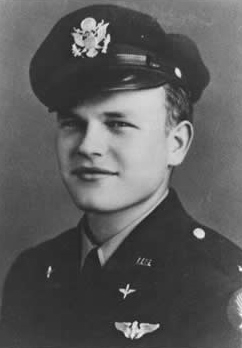 Bob introduced himself and told Lindbergh that as a child in Sheffield, Alabama, Bob had been the recipient of some candy thrown by Lindbergh out of an airplane. Lindbergh remembered the flight, and he and Bob enjoyed several hours of conversation at the event. 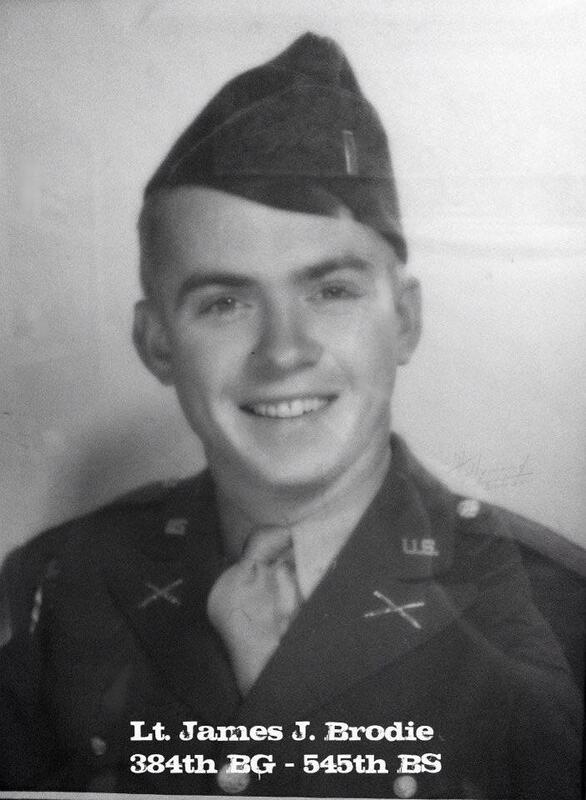 Robert McKinley “Bob” Mitchell, Jr. died last week, May 12, 2015. He was 93 years old. 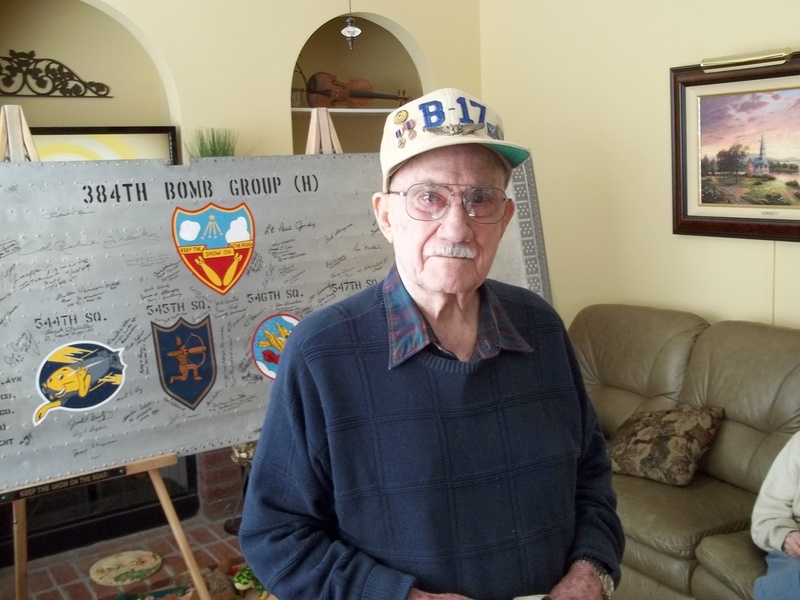 When I talked to him in April, I could hear the pride he had in his service with the 384th and the love he had for Willette, his wife of seventy-three years. For Bob, the war is over. Rest in peace Robert Mitchell. Robert McKinley Mitchell, Jr. is buried in the Oakwood Cemetery in his native Sheffield, Alabama.